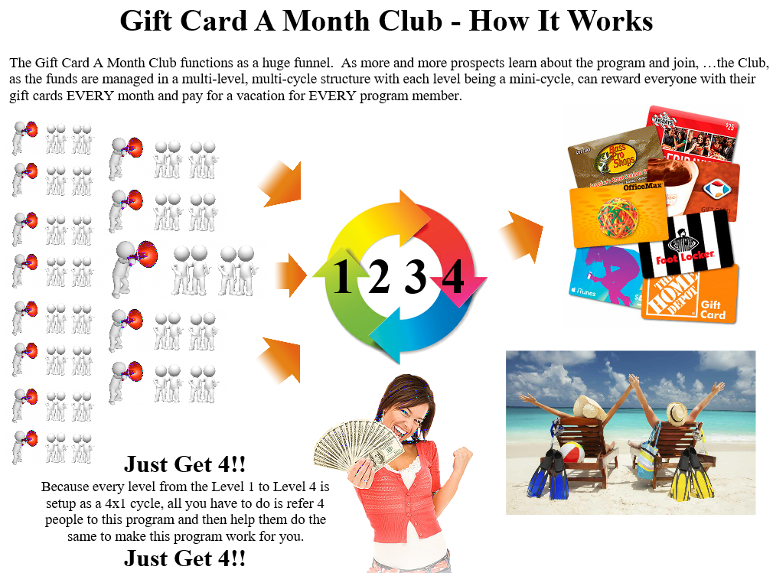 As indicated in the below image gallery, there are 4 Gift Card Levels in the program, each Level containing 4 4x1 Cycles, with each Cycle paying out in multiples of a particular denomination of Gift Card through that whole Phase. At the end of each Phase, once completed, you are entitled to either a cash bonus or a vacation reimbursement, from $1000 to $10,000. The focus of the Gift Card a Month Club is to help you save your out of pocket money in the areas of Fuel, Food, Fashion and Fun so you can put that extra money you're saving towards keeping a roof over your or your family's head and the lights on. As you cycle through the first phase, you'll receive a stream of fuel station gift cards to help with your fuel expenses so you don't have to pay out of pocket. 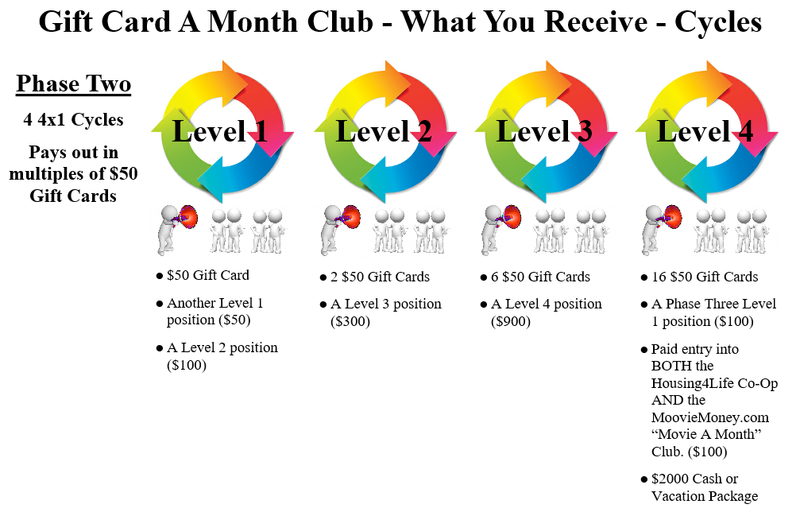 As indicated at the end of the first slide, when you complete your first pass through the first phase, you are advanced to the second phase which pays out in $50 gift cards. These gift cards will be a combination of grocery gift cards and your favorite places to eat out. 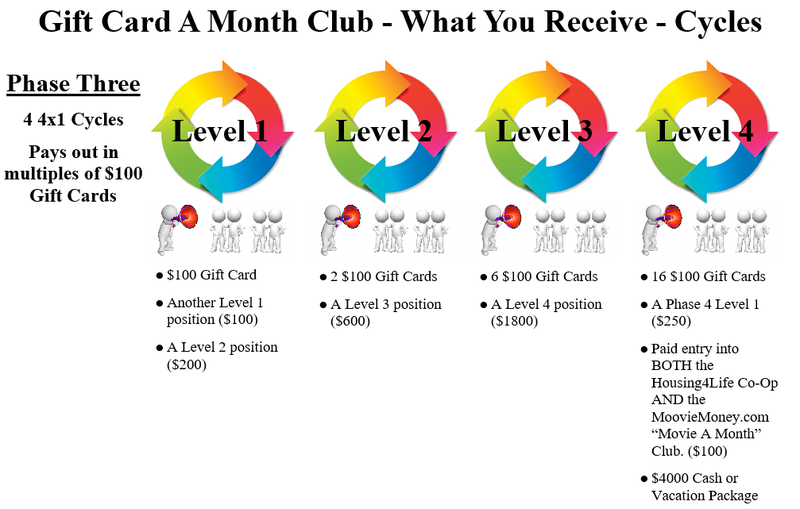 Additionally, you may have notice in reviewing the colored diagrams that the first cycle in each phase repeats, so you'll never have a lack in gift cards to use. Many people have higher cost tastes when it comes to fashion. Nike, Levis, and others fine threads are among some of the higher prices apparel in the industry. 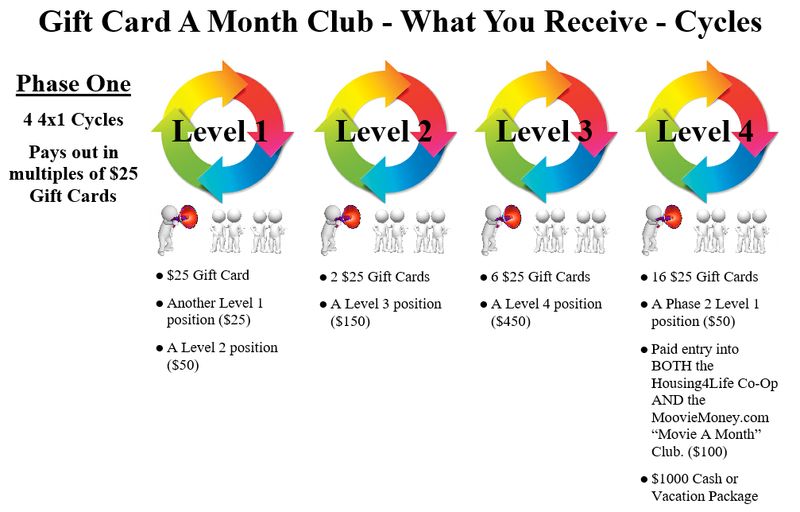 Why spend your hard earned paycheck when as a member of our Gift Card a Month Club you will receive gift cards you can use instead. As you cycle through the 3rd phase, you'll receive a stream of $100 gift cards to your favorite places to shop for clothing and accessories. Did we forget to mention that we pay for your fun also? Stop paying out of pocket for your visits to the zoo, Disneyland, your hotel stays, or your cruises. We've got you covered. As you cycle through phase 4, you'll receive $250 gift cards to help pay for those fun spots you life to visit with your family. Ready to join yet? Click on the button below to get started.